Now that we are into fall and the temperature is dropping, I want to share five Design Essentials® fall hair care tips from Global Artistic Educator, Cyd Charisse, of Atti2des 2 Hair & Nail Salon in Maryland. 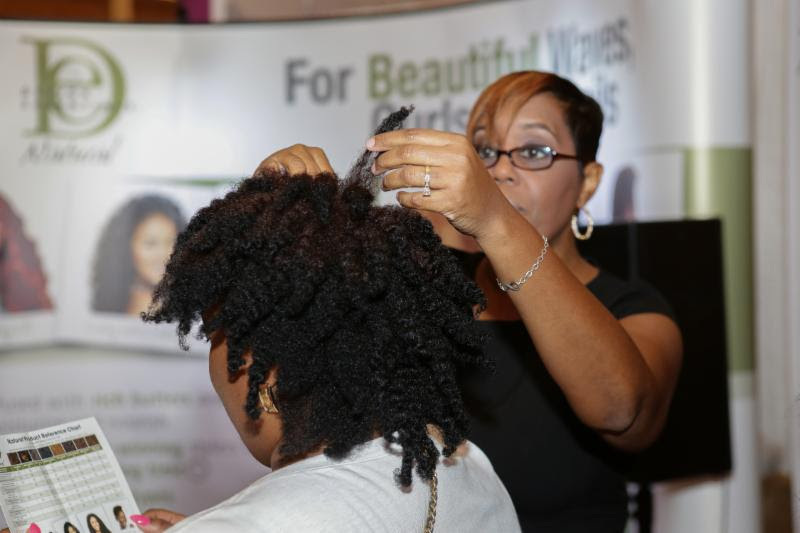 She shared these tips at the recent Ubiquitous Hair Show in DC, and as one of the few hair shows that focuses equally on both relaxed and natural hair, these tips will help women of all textures and types get their best fall tresses! 1. A healthy lifestyle, nutritious diet, exercise and drinking water are excellent ways of producing healthy hair and a balanced lifestyle year round. 2. Healthy gorgeous hair, whether it's relaxed or natural are a result of using healthy products and styling techniques. "My exclusive product line is Design Essentials," says Cyd Charisse. "Design Essentials products provides moisturizing shampoos, deep conditioners, oils and treatments that guarantees your hair to shine, strengthen and give bounce and elasticity to your hair." 3. Use silk or satin pillowcases and scarves to keep your hair from drying and breaking off while you sleep. 4. Steaming increases blood flow into the scalp, which can lead to increased hair growth. "If your hair is dry and dull, one of the many custom blends I use from the Design Essentials Professional line is the Stimulations Super Moisturizing Conditioner, Hydrience Argan Moisturizing Creme and Hydrience Argan Moisture Replenishing Mist. This custom blend combination adds moisture, stimulates the scalp and adds shine to the hair." 5. The right cut makes transitioning from summer to fall hair painless. "Shaping, trims and dusting ends in my opinion are as needed. When cutting wet, I protect the hair with a light mist of the Design Essentials HCO Leave-In Conditioner. It protects the hair and avoid the ends of the hair from splitting. It is also an awesome thermal protective when air forming the hair." Which of these tips will you incorporate this fall? I need to buy myself a steamer. I wrap my hair up with a satin scarves always and I keep my hair more moisturize in the Fall and Winter months. No I haven't heard of Q Redew but I'll check into it. Thanks for the link! I love steaming but I don't own one. I definitely will invest in one. Also, trimming and shaping my hair while promising to eat healthier. Thanks for the tips! Thanks for checking out this post Hannah! Trimming is definitely another great thing for our hair. I've met so many women who are afraid to lose length by trimming, but trimming keeps hair healthy and full.